After a successful week in Bogota at the Centre for Memory, Peace and Reconciliation, I traveled to Medellin, Colombia’s second largest city, to give another VR workshop and present the immersive experiences at the Medellin Book Fair. 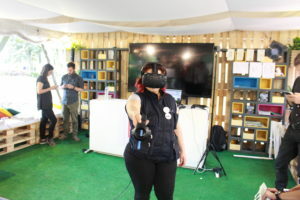 The workshop was held at the Parque Explora, next to the Botanical Gardens, which has proudly jumped with both feet first into VR and interactive experiences. 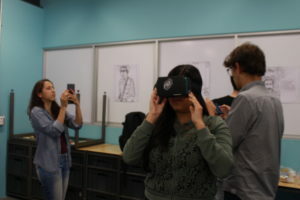 Some of the staff attended the workshop, which we deliberately kept more conversational and open, and the feedback to the AR triggered 360 videos as well as the Vive was extremely positive. It did highlight the dangers of asking journalists and storytellers for feedback however – ask 20 of them for advice and you’re bound to get 30 responses back, all of them different (and a large number of them contradictory). Questions were raised about the ethics of recreating survivor stories of the violence – raising the question of whether giving users agency within trauma narratives implies a sense that they could have acted differently to have avoided their fate. The following day was an event in the Medellin Bookfest itself, which was given pride of place in the amazing setting of the city’s botanical gardens. The Centre for Historic Memory’s space was the size of a couple of shipping containers, decked out in a mixture of light wooded panels and shrubs. We set up the Vive at the back, with the 360 video portraits pasted to the sides of bookshelves that lined the sides of the space. The room-scale experience was new to everyone who tried it, and every single person came away wide-eyed and surprised at how real it seemed to them. Predictably, there was a steady stream of younger attendees who wanted to give it a go, and of course we let them try it. Often they were the fastest to acclimatize to the reconstructed digital space, as well as the interaction system with the controllers and teleport points, but their reactions were often solely concerned with the visual element and less with the core of what those featured in the story were saying. The question of attention is a theme that frequently comes up in the context of “empathetic” narratives, or stories designed to influence viewers to develop a strong bond with the characters in the stories they read/watch/experience. I don’t think this is germaine to VR alone – it’s a hurdle facing all media as audiences are increasingly more demanding, impatient, easily distracted and unlikely to feel like investing long periods of time within a single experience. Media outlets duly cater to this ever-dwindling lack of bandwidth, pushing the narrative format into tighter and tighter constraints, and so the cycle is perpetuated. Unfortunately, this restlessness doesn’t preclude an extremely high level of audience expectation: readers (or players/users – information consumers, let’s say) want to run the gamut of emotions without having to walk first, if at all. Hence the high bar for empathy in the most recent wave of VR offerings, and Chris Milk’s ubiquitious “empathy machine” quote and concomitant backlash. In the same way that good VR can engender an empathetic response (heightened perception of another’s internal emotional or physical state/ perspective-taking), so can good fiction. Similarly, bad VR has as much chance as a badly written novel at getting to that same psychological state. HOWEVER it should be duly noted that thanks to Silicon Valley ROI dynamics, which likely played a huge part in the Facebook/Oculus merger that brought the price barriers down in 2014, the level of perceived expectation in this new tech was sky-high. Not ideal for nuance. And almost entirely likely to disappoint. This level of expectation in VR virgins, coupled with a predictable fascination with the technology, is only likely to disappoint new users expecting to be teleported into another person’s shoes at the tap of a Google Cardboard icon. This novelty – the head-moving, tennis-match-watching back and forth surge of surprise that I’ve noticed a of new users experience – is another huge barrier to the calm, reflective mood that audiences need to be in if they’re to closely pay attention to the essence of the story, chiefly through listening to the protagonist’s words. It’s a real pleasure – not to mention a privilege – to put people into a new immersive world and literally direct strangers through an experience you’ve designed, but all of it is by the by if the only takeaway they’re left with at the end is a fleeting sense of the visuals and that sugar-high rush of the new. That’s why I think that the physicality, tactility and room-scale level of immersion that comes from true VR is what is real going to benchmark this medium in terms of its potential – and that 360 video will remain the gateway drug better suited to mass distribution and shorter engagement times. What do you think? Let us know below in the comments.